Civil rights leader and Emory distinguished senior scholar Rev. 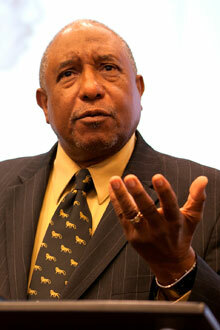 Bernard LaFayette Jr. Noted civil rights activist Bernard LaFayette, Jr. was only 22 when he took on the directorship of the Alabama Voter Registration Campaign for the Student Nonviolent Coordinating Committee (SNCC) in 1962, and he had his work cut out for him. The job was in Selma, Alabama, where only 156 of 15,000 blacks of voting age were registered on the county voting roster. "When I made the decision to accept the position in Selma, I gave no thought to whether I would live or die. I was already convinced that it was a dangerous and life-threatening place," says LaFayette, now a distinguished senior scholar-in-residence at Candler. But he went to Selma anyway, determined to give African Americans of the South a voice. LaFayette’s new memoir, "In Peace and Freedom: My Journey In Selma" (University Press of Kentucky, 2013), recounts his years in the city that played a key role in the movement toward racial equality in the United States. "I didn’t know what I would find as I went down this road," writes LaFayette. "Not only did I have a strong curiosity, but I had a strong determination to do whatever I could to turn the situation around. There was never a doubt in my mind that change would eventually come." LaFayette was already a seasoned activist and a leader in SNCC when he accepted the position to head the voter registration campaign in Alabama. A proponent of nonviolent resistance, he took part in sit-ins while he was a seminary student in Nashville and participated in 1961’s Freedom Rides, a movement initiated to enforce federal integration laws on interstate bus routes. Later, as the leader of the Alabama voter registration effort, LaFayette worked alongside MLK and other influential activists to organize the Selma-to-Montgomery marches, which were critical to the eventual passing of the Voting Rights Act of 1965. In the foreword to "In Peace and Freedom," fellow civil rights leader and Congressman John Lewis says of LaFayette’s historical account, "No one, but no one, who lived through the creation and development of the movement for voting rights in Selma is better prepared to tell this story than Bernard LaFayette himself."